As any of you who have ever read "The Twain Shall Meet" or know me from Twitter or on Facebook, or have read any of my comments on CBC.ca already realize, I am completely disillusioned by the Harper Government. I absolutely hate their closed minded, confusing, oddly ideological, "catch me if you can", and strictly scripted approach to governance and information. I have come to not trust them either, to; tell the truth, to share information, to stand and take uncomfortable questions, nor to show any signs of compassion, reason, or any sign of a caring attitude towards Canadians. I have come to expect only contempt, deflection, deceit and denial from the entire caucus, cabinet and their leader. I realise also, that many Canadians are being told subliminally by the minions of the Conservative Party of Canada, who would have the population in general fail to vote, and work their own asses off to get their base to the polls, that nothing ever changes in Ottawa. I feel that as a result of this 'Meming', as I like to call it, (based on the French term 'meme chose' meaning, of course 'same thing') that far too many Canadians have already come to believe that all political parties and all politicians are exactly like these insufferable ideologues. I do not want to believe that, as it would mean that there is no way out of these tough (meaning Tory) times. 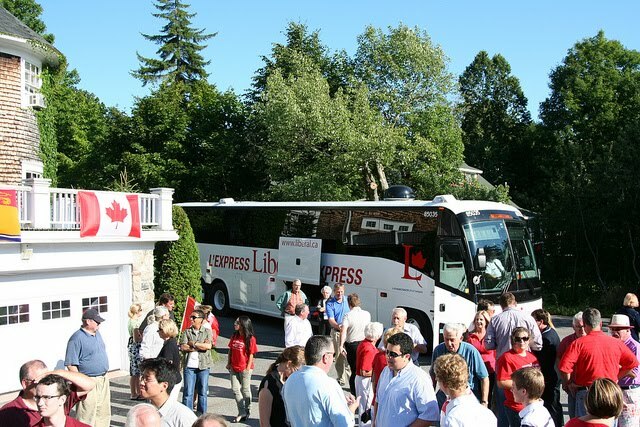 So, when Paul Zed, former liberal MP, invited me and a lot of others to attend a Barbecue in his backyard, and to meet the Liberal Express in Rothesay, New Brunswick, I decided that it sounded like a great way to get some perspective on the subject. I must admit at this point (again, no surprise to many) that I had already developed a growing deep respect for and a positive impression of what I felt and still feel are Michael Ignatieff's; impressive intellect, reasoned perspective, honourable motives and his compassionate vision of Canada, which I had already taken the time to get to know. I was quite sure that it was a vision not unlike my own. Besides, I thought, it is an absolutely beautiful drive from Moncton down to Rothesay N.B., which is a very pretty little town just this side of Saint John, some 150 kilometers away down a rather modern highway. The views along the way are spectacular and the Kennebecasis River Valley is incredible in Summer. In the afternoon sun, on August 1st, New Brunswick is as green as Ireland. Not only that, but it was promising to be perfect weather for a drive down the Road. So, careful to recharge a few batteries so that I could take some pictures, I did what I always do, and forgetting my camera at home, sped happily towards Saint John with it's batteries securely in my pocket. I had no trouble at all to find the place, (ain't google grand?) but had to park on a side street a short ways from the house, as I was, still plenty early but far from the first to arrive. I walked there while chatting about the event with a nice, slightly older gentleman and was soon in the Zed's back yard, behind a large, beautiful two story house, where a couple of hundred people were already gathered. I soon spotted Paul, who greeted me enthusiastically and warmly, introduced himself, and asked me to make myself at home. We chatted for a few minutes and he soon put me totally at ease. He showed me where I could find something to eat and also told me that the House was "wide open" if I cared to go inside. In the Maritimes, kitchens, if not the rest of the house, are almost always part of the package. I said that I was a progressive political blogger and a proud member of "Canadians Rallying to Unseat Stephen Harper" and that I had a few Questions to ask; him, anyone who was aboard the bus, and also his quests. He said that that was the purpose of the evening, that he expected me to have questions and that I was more than welcome to ask anything of anyone at all. He described his professional and personal relationships with Michael Ignatieff as one and the same, and a warm and close one and that. They had, he added, been good friends for a while. I told him that I was aware of that and that I was hoping to get Michael's attention for a while to ask some questions. Paul laughed and said he knew before he invited me that I would feel that way. We had a good laugh, and I said I'd wander around and that his back yard seemed an "odd setting". He looked momentarily troubled, as I had hoped he would, and I said that it was "the nicest place that I had ever lingered while waiting for a bus". So, wander around I did, and grabbing a bite to eat from the barbecue and a simple salad I ate while sizing up the still growing crowd. Oddly, they did not strike me as elitists, and they seemed to me like any average New Brunswick crowd. It occurred to me then that the Conservatives did not own the "Tim Horton's crowd" as they so often claim, and that I was clearly standing among them as we waited for the bus. After eating, I wandered out to the road to smoke a quick cigarette, and just as I reached the roadside, a taxi pulled up. A tall, rather large man, popped gingerly out of it carrying a travel bag. 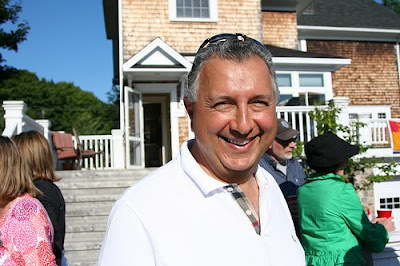 I recognized him as Gerry Byrne, a young and promising Liberal MP from Newfoundland. We soon fell into a pleasant conversation and I asked him his impressions of "Strategic voting" as a better alternative to Danny Williams' A.B.C. campaign, which had worked so well for the Federal Liberals on "the Rock" in the last election. He thought that that strategy was a worthwhile endeavour in the rest of Canada, but that A.B.C. was all that was needed in Newfoundland, citing that the Liberals were so strong there due to Harper having reneged as soon as he became Prime Minister on a written promise to "keep non-renewable energy resources out of the equalization formula" An interesting conversation, to say the least. It was not long after that that the bus arrived. It was not the run-down rickety old bus that is described in Conservative circles, but a large, clean, quiet, rather pretty bus. In the strong sunshine, it was brightly white, made more so by the richly red lettering and darkly tinted windows, which hinted of air conditioned comfort. In fact it was looking rather smart! Why was the main stream media missing this? That is another blog entirely. As it pulled in and came to a stop, a loud applause, and excited voices gathered around it. I was excited to see who exactly would be on board. I have been following it on Twitter, and can tell you that the cast keeps changing as different members of the Liberal team join it at different stops as Mr. Byrne was about to do. The first person, that I recognized was Senator Jim Munson followed by Marlene Jennings, one of my absolute favorite Baird baiters from Question Period, whom I suddenly found myself face to face with. ﻿﻿ ﻿Next came Judy Sgro, formerly Veteran's Affairs Critic, and still a member of the committee responsible for overseeing it. Next came the talented Dominic Leblanc, followed closely by My current MP, Brian Murphy, whom I had become re-acquainted with as he spoke at the CAPP Rally in Moncton, in January and with whom I had the pleasure of talking over Coffee at Tim Horton's right after the Rally. I was, as I said, standing face to face with Marlene Jennings, who was accompanied by her teenage daughter whom she introduced. I noticed that she had cigarettes and after spending almost an hour on the Bus, we soon found our selves alone and out of the way, smoking and talking about the G20. I had asked her opinion on the prospects of an inquiry, and she was quite candid about her dissatisfaction of the authorities handling of the crowd. She was refreshingly open, and was aware of the man from Thorold who had been relieved of his prosthetic leg, and literally dragged off to the detention center for a 27 hour ordeal. She knew about many of the stories that I had heard and was not impressed with the situation saying that she felt that even though it would be hard to ever get Harper to agree to an Inquiry, she did seem to think that some of the questions being asked would result in proceedings against at least some of the police officers involved. This she said could be done with or without any official inquiry. I was impressed that she was so comfortable giving me her take on it. We made our way back toward the crowd and parted as she approached another guest who wanted to speak to her. The next person I spoke with was Senator Jim Munson, who worked with now controversial Senator Mike Duffy years earlier while they were both with CTV. He was less than shy as he described how Mike had declared during the Chretien years that he was "quite willing to become a Liberal", if it would only get him a Senatorship. I saw right away that this was scoop enough to satisfy even a real reporter, so I asked if he understood that I would be sharing that story, and he added that it was not a secret and added that it is a shame that Duffy was now only a shallow shill for Harper and had become a mere caricature of himself. I thanked him for his candor and accepted his business card. I was not surprised to hear that Duffy story. Not really. I can count on one hand those who still feel good about Duffy. The one who comes quickest to mind is the often irascible Ezra Levant who seems to tolerate him quite nicely as seen in an interview he recounts from 2008 with Mr. Duffy, then still with CTV. 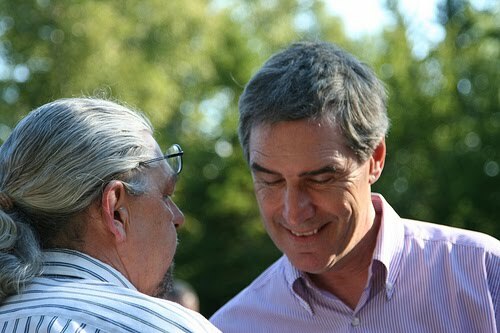 At this point I realised that I was within a few feet of Michael Ignatieff, and I slipped in closer and soon got a chance to meet him. I had been watching him move easily about the crowd and was amused that whenever he met anyone, he introduced himself. Was there anyone there who did not know his name? Probably not, but at any rate I found it to be charming and not the habit of an arrogant man. that this was not Stephen Harper. This guy was listening! I shook his hand and introduced myself, as did he. Again, I found it disarming. I sensed that he was comfortable and I was not made nervous by him. I told him a few things about myself and that I had a few short questions for him from some of my friends on Facebook. I asked him a couple of questions about life on the road and such and then asked, if he was going to be asking for an Inquiry into the Police actions at the G20 in Toronto. He said much the same thing as Marlene Jennings, although, like her it never sounded scripted in the least. He was simply responding to it by giving me his thoughts on it. He said that he saw no need to press for a Federal Inquiry, as it was unlikely to happen under any circumstances, and like Jennings had said, that there were Provincial Government, and Internal Police Inquiries, as well as many different involved interests launching individual proceedings on behalf of many individuals. He was convinced that these would shed a lot of light on the subject and that it was his opinion that the Liberal Party was more interested in laying the blame squarely at the feet of Stephen Harper. He went on that Harper, could so easily have chosen a more suitable location almost anywhere outside of Toronto, and that the city had tried to make it clear that they preferred that it not be held in the GTA and that it could best (as in more cheaply and more safely) be done at the Exhibition Grounds. He said that Harper absolutely insisted that it be held, in what became the RED ZONE, and that the city was not given any other option. Ignatieff seemed to think that by the time all of the interested parties were through with the process, justice would be served. As I have had a few days to digest it and to look into what exactly is already being done and all that is looming, he may very well be right on the money. He will, I think, be satisfied that Harper will be ultimately made to pay, by the ombudsman of Ontario, by the police commission in Toronto, by the People of Canada, who are forced to pay the Billion plus for it and that the police involved will be held responsible by individual prosecutions launched in the name of individuals and not by governments. He made it very clear that he wanted to stay out of the fray and let these forces do the damage, and that he would do his best to keep Harper at the very center of it all. I suspect that he plans to be busy getting ready for an election call that may not happen right away, but that he feels he owes it to Canadians that he be ready for when it does. If he has this figured correctly it seems obvious that Harper will be busy as well! And i hope distracted. I will stop here for now, but I will publish this and edit it as necessary later and add the rest of the story after I sleep for a few hours. It is now 6:44 AM in the Good Ol' Maritimes. There is a whole lot more more to tell! see Part two below. Thank you Kim. Can't wait for the next episode. :) Good read all the same, though. Looking forward to more. Thanks libVince. You have no idea how funny your comment is. I stayed up all night writing a blog that I published at 6:47 AM and had promised much earlier. I spent the day getting my computer fixed and still missed the deadline. The last sentence in the blog explains that it still needs an edit and some guy "cites" a spelling error. Terrific, Kim. Having done my homework, I also have great respect for Mr. Ignatieff. I believe that his time in opposition when there has been so much turmoi. will serve him well in the future. Did you have opportunity to talk with Dominic LeBlanc? Thanks Kim, Well done ! Kathleen, thanks and as it turned out I only found time to meet him very briefly. He is the quietist of the bunch of them according to his cousin whom I met the following day completely by accident. I went to the wrong entrance to Peoples Park Tower, the site if the Monday meetings in Moncton and Dominic's cousin let me in and took me through the building to the meeting and afterwards escorted me back through to my car. I spent more time with him than dominic, lol. I found you through a link at my friend Gary's blog. I'll be a returnee to Canada and a Maritimer this autumn and I'm already very interested in getting rid of Harper. It's nice to read such good news about Ignatieff. Wow, Kim, what a beautiful tale. The best part is that it's true!! Spread the word, Kim.....NO Mr. Harper ---not all Canadians are behind your egregious and contemptuous "Leadership" style to directing this Country. Thanks Paula Stewart, I'll send along Part Deux!